Happy Halloween! 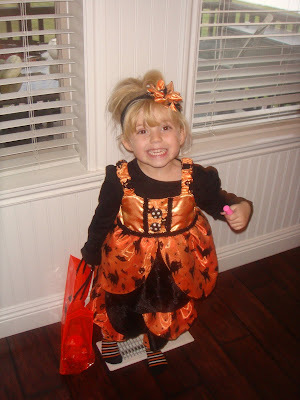 Here's Emma Jayne as Witch number two. Yes, this is the second time she's been a Witch (http://paigehill.blogspot.com/2008/03/emma-jaynes-halloween-costumes_02.html#links). Not the same costume, mind you. But a Witch non the less. I REALLY wanted her to be Cinderella. Had the perfect pattern all ready to go. When I showed it to her, she said "No Mom, I really want to be a Witch". "But Emma", I begged, "Wouldn't you RATHER be a princess?". She wouldn't budge, and no amount of cajoling was going to change her mind. Luckily, my friend Patty Young of www.modkiddesigns.com sent me a really cute pattern that I was excited to try. I also had a bunch of fabric left over from the first Witch, so I set to work on Witch #2. Patty's pattern (called Emma, appropriately enough! ), was one of the easiest patterns I have ever used. The directions were very easy to follow, and the sizing was spot on. The pattern even included a little purse because, let's face it, every little girl needs a matching purse! Thanks Patty for making my second little Witch costume easy as pie and cute as a button:). Paige, Emma's costume is so darling! It's so exciting to see what you come up with ever year! You are so creative and talented! What a doll! Love it! You left a comment over on my blog about pattern testing but I couldn't find your email. I am good on testers for this one but I have some more stuff coming up if you want to test for that. If you want one of these Hazel Hipster patterns to giveaway on your blog - I'd be glad to send one off to you. Thanks Paige. She is absolutely adorable in every way. 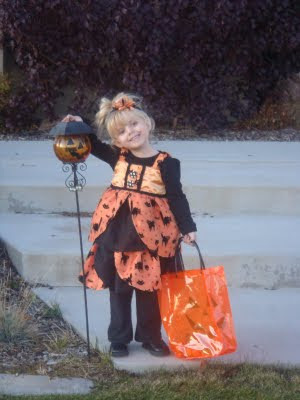 Your cute costume for her only adds to her natural cuteness. Good job Paige!